What a great regatta this year at St Barths. Highlights has to be the local community recovering from a devastating Hurricane back in September. Watch the hard work of the locals in last video above "Overture" . On the racing side, we saw quite a bunch of talented teams plus further equipment devel like the future defacto standard Decksweeper mainsail, which was implemented first by Steve Brewin in late 2016 & Mischa Heemskerk early this year at Denmark Worlds. 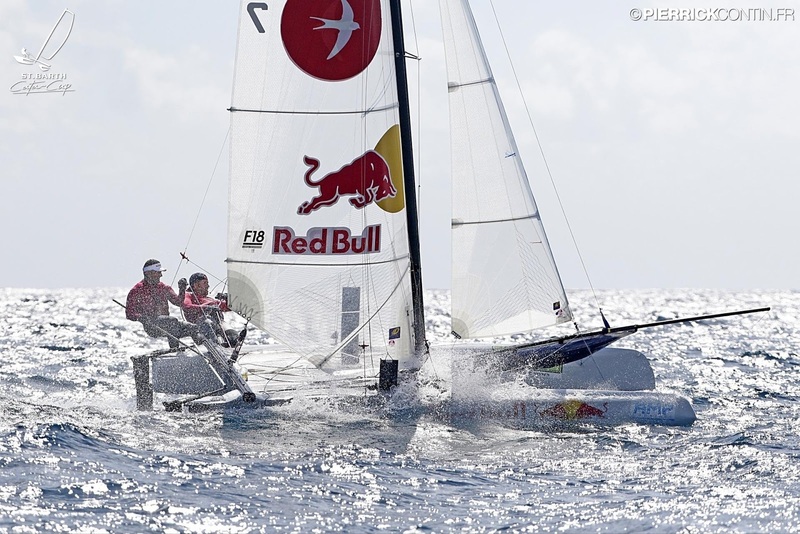 The title race was close through the whole regatta. 7 were races completed during 4 days. 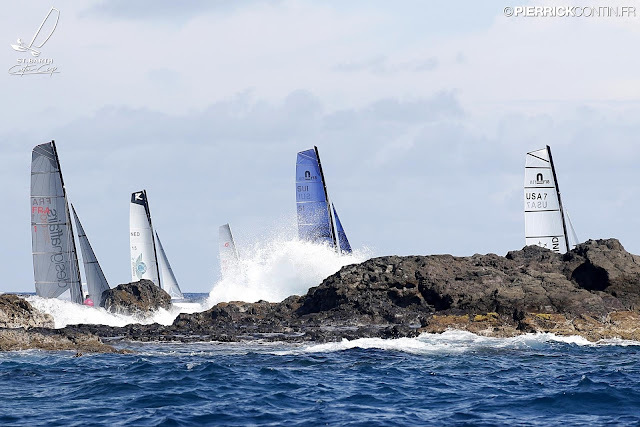 Paschalidis & Trigonis, Demesmaeker & Gagliani and Cammas & Vandame were the ones leading the rankings, all sailing latest DS sail devels , but some teams sailing standard rig went for the hunt against these top sailors. 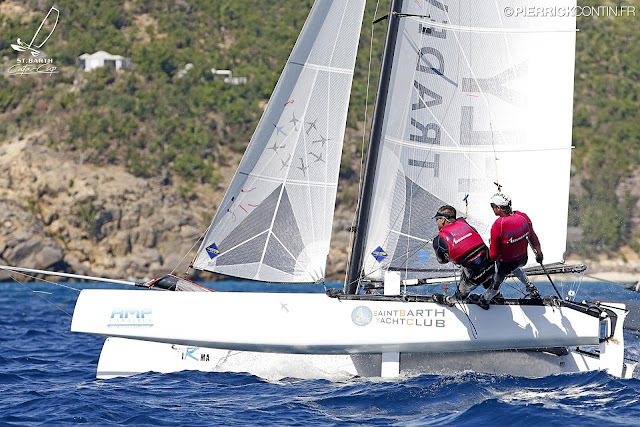 After 7 races Danny Paschalidis & Kostas Trigonis (Scorpion / 1D DS) finished in first place overall, followed by Arg sailors Cruz Gonzalez Smith & Mariano Heuser (Infusion / standard Nacra mainsail ) and third place for Patrick Demesmaeker & Olivier Gagliani (Goodall C2 / Goodall DS). The Argies finished 2nd in 2016 Worlds, 6th at Denmark 2017, a former 2nd at the North Ams , now a 2nd in another competitive fleet puts our friends as World Class contenders in the Formula 18 racing arena. In the breeze no issues to affirm they might be the one of the best out there. - Franck Cammas & Matthieu Vandame (Cirrus R2 / Oxo DS) finished 2nd in race 6th (a key race with double pts scored). But were protested later as they missed a buoy around the Island course. 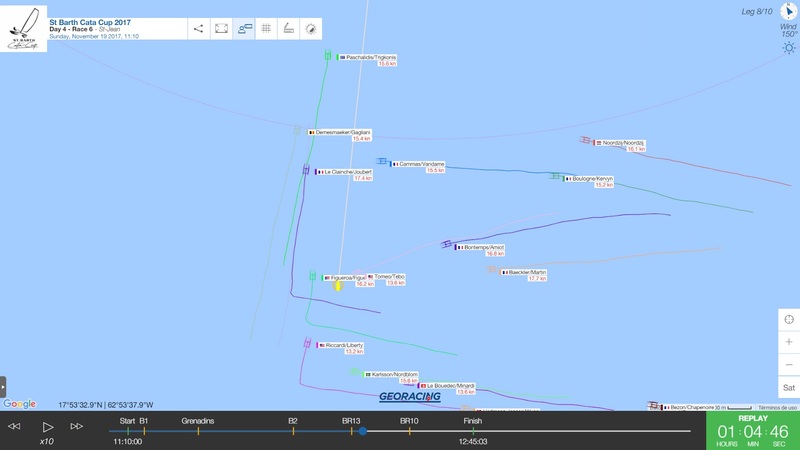 When they jumped that mandatory course they were in 8th place , way behind leaders Paschalidis-Trigonis , Demesmaeker-Gagliani and Smith-Heuser, at least 600mts behind and still to head ddown to buoy course. See tracking screens below. 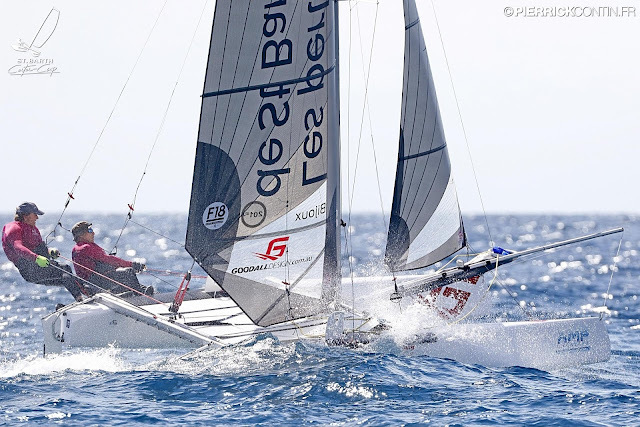 It was not a small error , but a huge advantage gain, thus it was not a minor issue affecting the final results of that race and the overall rankings. Watch track replay for race 6 here. Still Cammas & Vandame had a great event , and could have fought for top places inspite being a bit back in that double pts race. Last race they finished in 6th place. The new Cirrus R2 + the Oxo DS mainsail showed great speed , congrats to Manu Boulogne on their new boat launched few months ago. 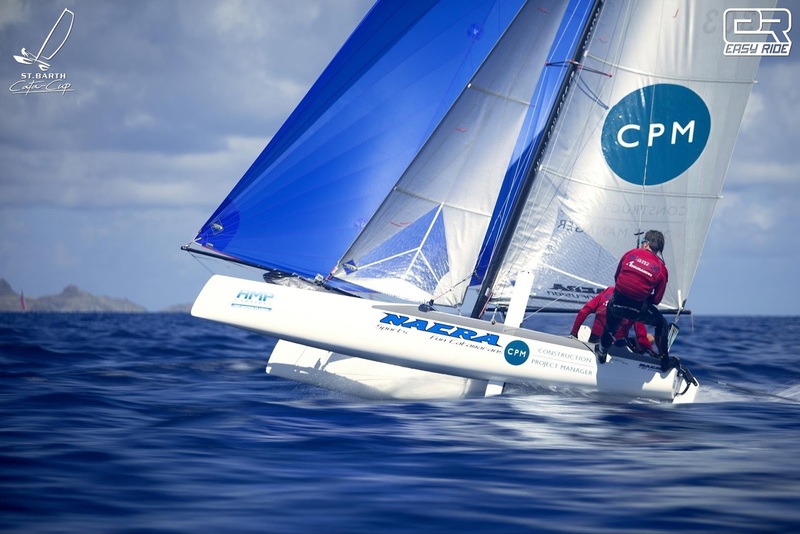 The Cirrus R2 with Cammas & Vandame made a great impression, but the Cirrus R1 also performed really well under Pierre Le Clainche & Antoine Joubert. Lets see if we can have those two racing again together in a World Championship. 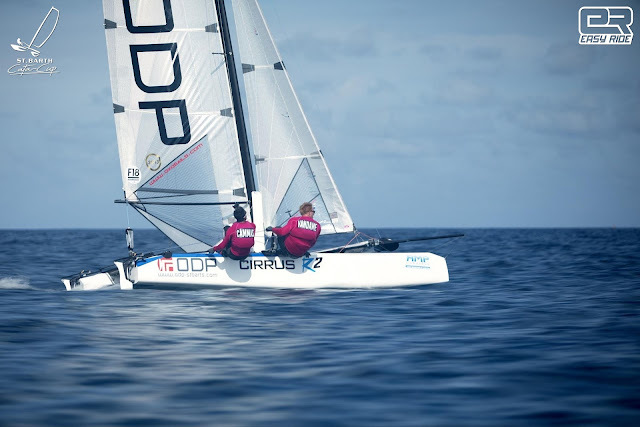 If you want to read "Disneyland" you go elsewhere, the truth is DS mainsails have a proven performance edge , specially upwind in almost all wind conditions above super light winds. 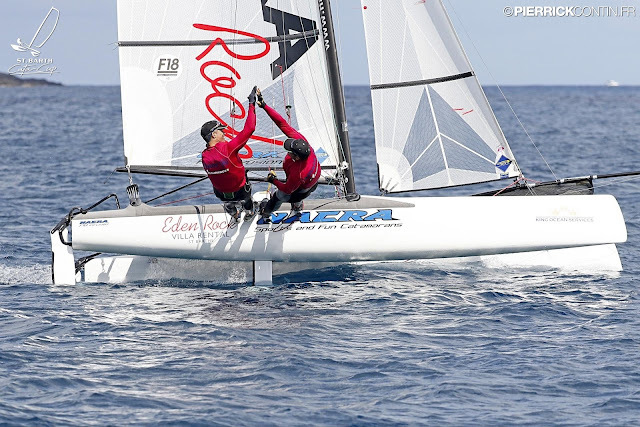 The Argentine crew, Gonzalez Smith & Heuser sailing an Infusion with standard sail showed how good this Class is , aside any perf gap here and there, you still need to sail the course properly and crew skills plays much in the whole spectrum of wind range. Same applies to Tomeo & Debo, Quiue & Keki Figueroa , the three crews raced with Infusions / standard sails, all managed to score a bullet each. At the Worlds Cruz & Mariano finished 2nd x 3 races behind Mischa-Stephan Scorpion/DS weapon in the breeze , Mariano reported a gap upwind but even speed downwind. We had 3 different Decksweeper mainsails at St Baths : Oxo Sails, Goodall & 1D, and were sailed by the top three contenders as noted in details above. Oxo & 1D featured a smaller foot as described earlier this week, which is confirmation on our previsions for that 1mt foot . The other aspect to note is 1D boomless solution a la Brewin, which work really good for the winners, establishing you can even cut costs or simplify equipment with new DS sail devel. Next week we will have the 2017 Arg Nats with some interesting equipment matchup, report later on the week. After Denmark Worlds I had some comments on Mischa's DS sail being the only source of additional speed, taking away Mischa-Stephan skills and the Scorpion platform as any incidence. Well now, at St Barths, Danny & Kostas sailed against top notch F18 sailors and great platforms also equipped with DS mainsails, and the Greeks won sailing a Scorpion & 1D DS mainsail of their own. More than happy for them, as starting their project this year in the F18 was a challenge no matter the experience you have in other classes, the Formula 18 Class, has its own special aspects that must be learned, and now shortcuts are available aside getting all the racing hours you can get. Looking forward to Sarasota Worlds next year, the Greeks will reach that event in top shape which will give them real chances to aim for their first F18 World Title.